The publication today of some significant genetic research suggesting dog adaptation to eating starchy foods is a good excuse to expand on last week’s post on the evolutionary relationship between humans and mammals. More than the horse, the dog has the longest and strongest relationship with humans, born out by fossil evidence which might put the origins of dog domestication possibly as early as 33k BP. Aside from the implication for palaeodieters (if dogs have adapted to eating plant-derived starches isn’t it highly likely we have too? ), the coverage caught my eye for further discussion of the mechanism for early overlap between humans and dogs which led to domestication. The argument goes that as humans started to develop more stable and intensely used habitation sites, peripheral accumulations of food debris would have attracted wolves, which became over time habituated to humans and opened up a context for domestication. It’s a neat, passive explanation that fits our perception of the wild being at the margins of our “domesticated” social place and bleeding into it. I’m also interested in the explanation as it sets a human behavioral construct, The Rubbish Dump, at the center of a process of social interaction, self organisation and genetic change. In this sense it fits very well with my perspective of human behavioral signatures as being drivers of evolutionary change in terms of niche construction/allogenic engineering. I do have three questions about it which I’m just going to raise here as food for thought. Firstly, if we are leaving food debris dumps conspicuous enough to attract wolf packs, what else are they attracting? With bear and other dangerous predators in the environment, leaving accessible food is a recipe for disaster. We know hunter gatherers groups are smart about disposal in landscapes with other predators, so we should think smarter about this too or find the archaeological evidence. We have a much deeper history of leaving food traces in the landscapes, providing food sources for larger social predators like foxes and smaller scavengers for millenia. Why then does complex social interaction with the wolf happen so late? It would seem to me that, in the absence of a clear behavioral change in human food waste disposal, it is more likely to be driven by processes of human social or cognitive change. 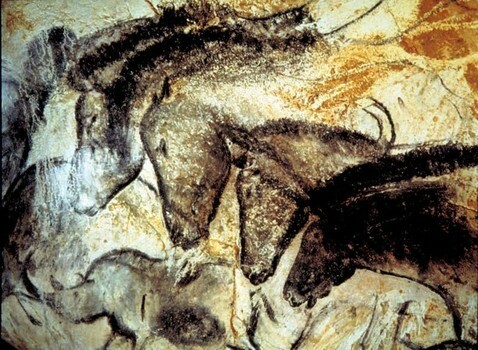 In the context of the Eurasian Upper Palaeolithic I think we should look to the changes in human behaviour relating to animal and human/animal hybrid portrayal in the exceptional record of art that appears after 40k BP. 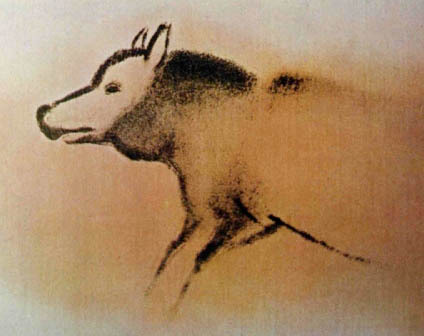 Whether driven by cognitive or cultural processes, the art suggests a important perspective on the relationship between the animal and human world, one which is routinely blurred to powerful effect. Is it possible that this blurring sets the stage for integration of some mammal species into human society? This leads me onto my last point. The hypothesis which see the wolf as scavenging on the margins of human settlement, is a very passive explanation that robs the process of an immediate, emotional as well as functional/economic basis for domestication. The relationship between humans and domesticated animals has a far more deeply rooted basis than simply utility and food. Canines embed themselves in human societies because wolf pack behavior matches our primate social structures enough for a functional relationship. If we accept this fact then we must also accept that human and dogs are active agents in these dog-human hybrid societies, negotiating biological, hormonal, resource sharing and social dominance dynamics to constantly maintain position and cohesion The complexity of this incredible process is rather reduced by the dog on the dump hypothesis. Ultimately I think we have to look at how we conceive and use the term domestication. It’s far more than a taming of the wild through conscious manipulation, humans as a force of natural selection and genetic engineers. We need to think about the transformations at work within our own brains and societies. Perhaps viewing the integration of wolf into human societies as a significant addition to the Late Pleistocene package of behavioral modernity, rather than a prequel to Holocene domestication of livestock. They Eat Horses Don’t They? Us Brits love a good food scandal, whether it’s salmonella in eggs, spinal cord in our beef products or killer food colourings, the media doesn’t have to work hard here to whip us up into a frenzy. It’s rather ironic given the average British appetite for mass produced junk food, but there are, apparently, lines we are not prepared to cross when it comes to eating. So the first great food shock of 2013 was the revelation that up to 30% of meat in various budget burger brands was not good old British beef but foreign horse meat. Yes, meat from actual horses, with hooves and manes and long swishy tails. I kid you not! I’m actually totally indifferent to this non-scandal. I’ve eaten horse a few times (horse sushi is the only way to do it justice) and I think its no better or worse than eating any other mammals. I’ve also spent some time looking at the half million year old horse butchery site at Boxgrove (GTP17) and more widely considered the long term predator-prey relationship between our two species before domestication. From this perspective, the revelation that the mechanically reclaimed sludge that goes into a burger had originated from one large mammal and not another didn’t strike me as one likely to provoke outrage, but it turns out us British are very particular about the genetic origin of our meat sludge. While the cheeks and arseholes of a cow or pig are considered a treat when reshaped and slapped between two pieces of bread, bits of horse are definitely off the menu on our island. And yet other cultures, including our nearest European cousins, the French, are rather partial to an equid steak. We have a long evolutionary relationship with meat, possibly extending back to our last common ancestor with chimpanzees, 6 million years ago and certainly from 2.5 million years ago. Back then our Australopithecine ancestors were fuelling their evolutionary path with meat scraps, which can be seen by the marks left by their Oldowan stone tools on animal bones. So given we’ve had several million years to sort it out, shouldn’t it strike us as odd that there is no universal consensus on what constitutes an acceptable animal to eat? On the contrary we have a fairly universal propensity to holding all sorts of taboos over which poor animals it’s ok (or not) to kill for food and which, for reasons of sacred status, ethical concern or perceived uncleanliness should be left off our plate. That the British disdain for horse meat is quite deeply ingrained is equally surprising. After all we revel en masse in racing our horses to death over lethal hurdles and only abandoned their use in warfare less than a century ago, having ridden them previously at regular intervals into hell and shellfire. But despite our willingness to sacrifice our horses at Aintree, the Somme and the Crimea, damn it man, we’d never eat the beasts. So where does this red line in culinary acceptability stem from? It’s hard to make a case that our taboo against horse meat is ingrained in any issue of sacred value or uncleanliness, it’s a far more personal issue than that. The truth is, in British society, horses have a social status and position within our culture, which simply makes eating them unacceptable. It has struck me for a long time that human propensity for complex social engagement with the animal world is very paradoxical, and nowhere does this manifest itself more starkly than in our attitudes to which animals we hunt, kill or eat. The social brain paradigm has proposed that a large degree of our cognitive abilities stem from our abilities to establish, maintain, invest in and manipulate social relationships with each other. But I believe this ability goes much further than just interaction with each other. Humans are of course very capable of forming social relationships with individuals from other species at a deep personal level. This extends to integrating certain animals, at a cultural level, within human societies. It is often considered that there is a fault line between human understanding of animals as agents and animal products as things. If we consider that fault line in terms of human social capabilities it is potentially far more complex, animals can be viewed as agents but also as kin, colleagues, slaves, friends, spirits or gods; our attitudes to the ‘things’ we can derive from animals varying greatly accordingly to this perception. It has been at least 6000 years since we regularly hunted wild horses in Britain and for much of the later Holocene we see horses turning up in the record rarely as food and more generally as beasts of burden of one form or another. Through out our history the cultural relationship of the British with horses is just as exploitative as any other nation on the planet, but somewhere along the line horses were able to claim a stake (along with a restricted range of other domestic animals, notably the dog) as part of our extended social network. The horse is safe from the plate in Britain because it has been a relative winner in the inter species social drama of our prevailing culture. Modern urban societies have a problem enough being confronted by the living animal they consume in a bun, pie or pasty; let alone it being revealed as an animal considered part of our extended society. The issue opens up a paradoxical chink in our social integrity, one that I believe is both innately sociopathic and also an evolutionary necessity. Considering the arbitrary nature of human dealings with each other, understanding the paradox in our social intelligence could take us to darker places than the slaughterhouse. After Thoughts: Two things have struck me since writing this yesterday. Firstly that the real upraor should have been about the traces of pig DNA found within the burgers, this wasn’t the result of a corrupt food chain but apparently just part and parcel of reusuing processing plants over long time periods. The implication are that, unless you are buying from a Halal or Kosher butcher, its probably impossible to guarantee what DNA you are ingesting. Food taboos are currently near on impossible to maintain within the framework of urban mass consumption. Secondly, from the social hunting paradigm I’m starting to develop here, is it coincidence that the first clear examples for claimed hunting come from archaeological site associated with horses: Boxgrove GTP17 and Schöningen? Did the unique social behaviour of the horse leave it exposed to han intelligent predator developing abilities to read and manipulate it’s social behaviour to lethal effect? Reindeer feature early in the record of mass hunting. Both animals go on to become closely associated with humans in symbiotic roles beyond consumption. Could addressing the origins of predation as a social phenomena throw light on how we came to develop such a complex interdependancy with other mammals?